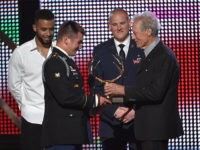 Clint Eastwood has reportedly set his next project, a film based on the thwarted ISIS-inspired terror attack in 2015 in which a gunman opened fire on a high-speed train traveling to Paris. 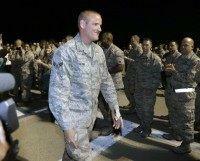 Spencer Stone, an American serviceman who with two friends helped stop a jihadist attack on Paris-bound train, has been critically injured after being stabbed early Thursday morning in midtown Sacramento. 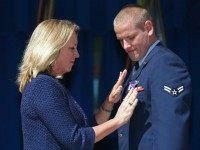 Details are still trickling out about the incident, but the good news is that Spencer Stone, the United States airman who teamed up with two friends to tackle a jihadi gunman on a train bound for Paris in August, is reportedly in stable condition after suffering multiple stab wounds in Sacramento. 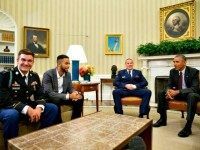 At the White House today, President Obama met with the three men who heroically stopped a terrorist attack on a train in France while on vacation. 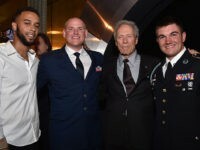 On Sep. 11, Sacramento will honor the three American heroes who saved countless lives when they thwarted a terrorist attack on a crowded train in Europe while vacationing there last month. 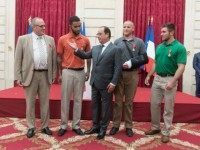 Three California men who received France’s highest honor Monday for thwarting a France terror attack will return to California and a heroes welcome complete with parade. 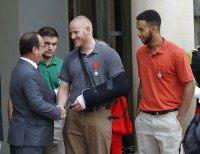 French President Francois Hollande wasted no time expressing his nation’s gratitude to the American and British heroes who thwarted a jihad attack on a high-speed train on Friday, saving dozens of lives and delivering a hog-tied ISIS lone wolf to the French police.